Some are saying the obsession has gone too far. Comedian Jimmy Kimmel slammed the concept of pumpkin spice flavoring on pizza during a taping of his show Tuesday night, saying, "Pumpkin spice is not good on pizza, is nothing sacred?" "I'm afraid I'm going to have to ask you to pick up your phones and call your senators," he added. "Tell them we will not stand for pumpkin spice pizza." Kimmel's crusade against the nationwide autumn obsession with all things pumpkin has triggered a heated debate on social media. Some people can't seem to get enough of it, while others are saying it has gone too far. This fall, pumpkin spice has found its way into everything from pet food to deodorant. Villa Italian Kitchen, the restaurant chain serving the pizza that Kimmel blasted on his show, responded to his comments in a Facebook post, saying they "respectfully disagree!" "Our Pumpkin Spice Pizza is awesome and we challenge you to try it for yourself!" the group added. Despite the hype surrounding pumpkin spice, the growth in sales for pumpkin-flavored products have slowed this year, according to the global data firm Nielsen. The group does predict, however, that sales of pumpkin flavored goods will bring in $414 million this year. 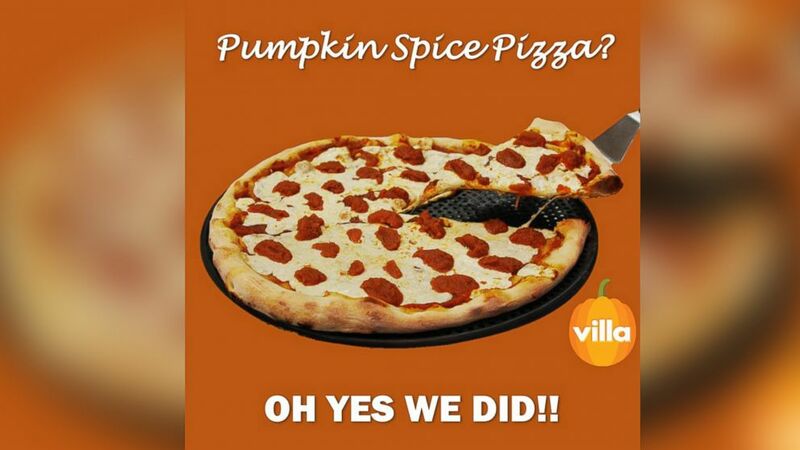 (Villa Italian Kitchen) The restaurant group Villa Italian Kitchen has unveiled a new "Pumpkin Spice Pizza" this fall.